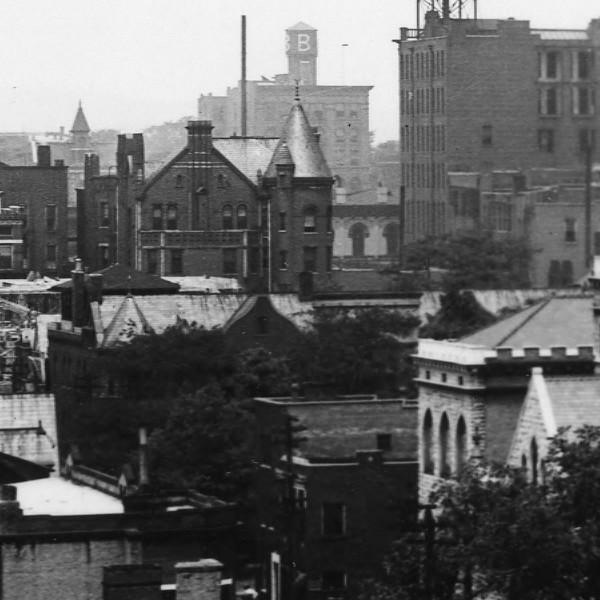 Standing at the corner of Clinch Avenue and Gay Street, in the canyon between the Burwell Building and the Farragut Hotel, one is imbued with a feeling that Knoxville is indeed a city, a cosmopolitan place, civilization built and prospering. There is probably good reason for this, as both buildings were constructed during one of Knoxville's boom periods at the beginning of the 20th century. Across the street, one sees the towering Holston. 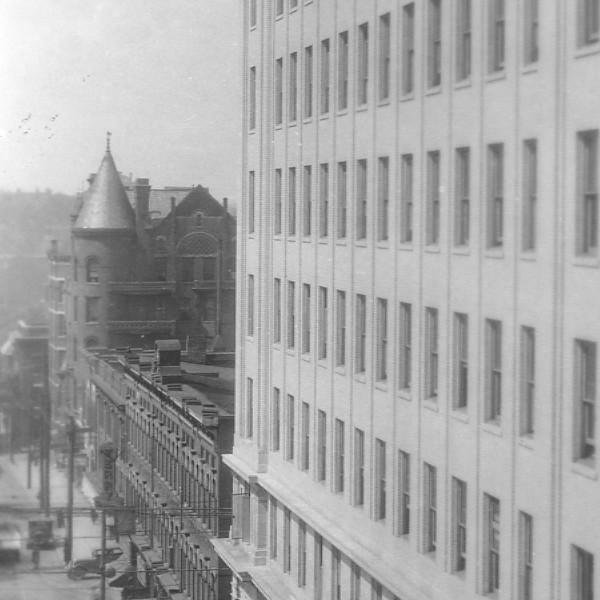 Once the home of Holston National Bank and then Hamilton National Bank in Knoxville, it too was constructed during that era of growth and optimism. (For those who don't know, there was a near twin of our Holston in Chattanooga. It still stands, but a 1966 remodel rendered it almost unrecognizable). Finally, the forth corner of the intersection is capped by the Museum of East Tennessee History. 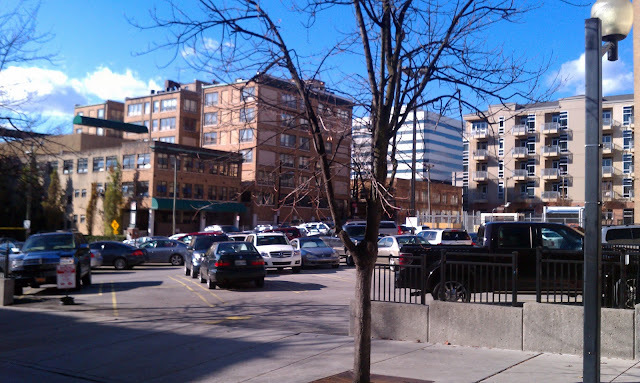 The corner is a recent triumph achieved during the genesis of a downtown renaissance. 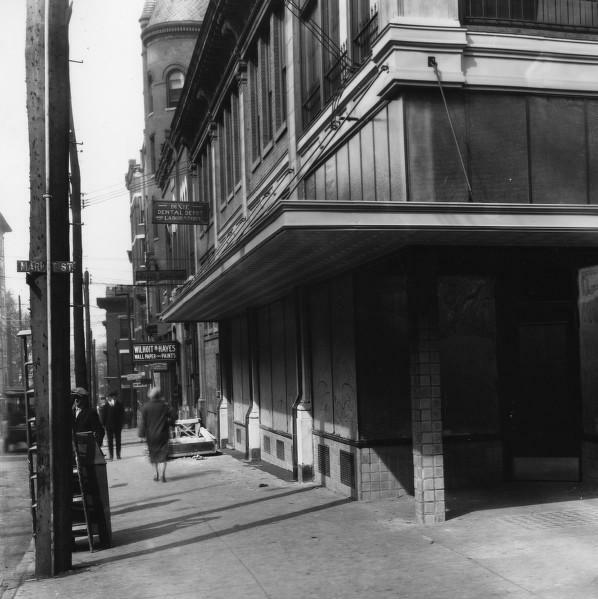 It seems that the early decades of a century are generally good for our downtown, but one block down Clinch, heading toward the Sunsphere, is a different story. As you walk west, between the history center and the Holston, you will pass the Knoxville Customs House on the left, a beautiful homage to a long forgotten period of prosperity in Knoxville. On the right, Krutch park, a lovely public space that once housed half of a block of commerce; Draughon's Business College, real estate companies, tailors, shoe shops, jewelers. As you cross Market, you will find yourself in between two mid-century modern bank buildings. Then, on your left is one of Knoxville's jewels, Le Parigo. This unlikely French bistro, with its small area of sidewalk seating, is situated across from one of Knoxville's earliest surrenders to the automobile and the suburban culture that it brought. As you sit in Cedric's establishment, enjoying what is likely the best Moules à la Provençal in the southeast U.S., you might imagine yourself on some chic French boulevard. 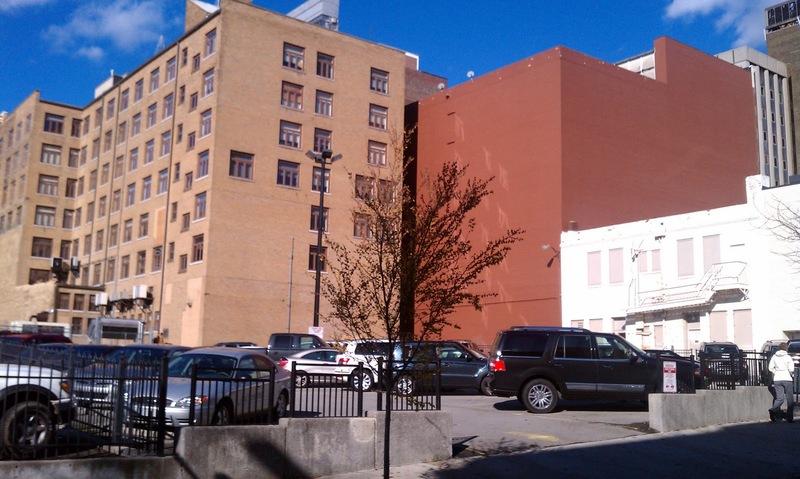 Instead, you are greeted by one of Knoxville's first surface parking lots. The View from Le Parigo, once the home of 417 W. Clinch Ave. The parking lot has been there, as far as I have been able to glean, since 1942. As far as parking is concerned, it was probably very ideally located between the headquarters of TVA in the New Sprankle Building, the Arnstein, and the aforementioned Plaza block (Krutch Park). Now, however, it appears that one has to be a member of a special club (perhaps a Home Federal employee) to park one's car there. Surface parking, which seems to have metastasized throughout downtown Knoxville, is especially prevalent on this block. At one point in time, this location could have been considered the most urban in all of downtown. 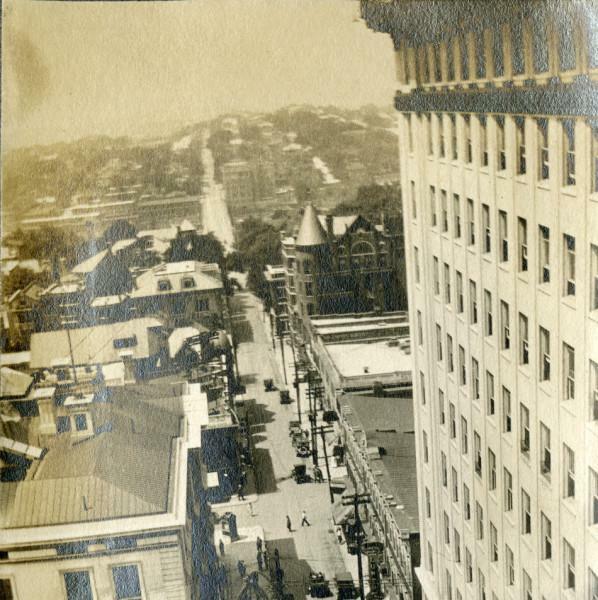 The block was once filled with buildings; the Sprankle Flats, the Park Hotel, the Acuff building, and the Hotel Vendome. Looking at an aerial map, one can almost make out where they all once stood. 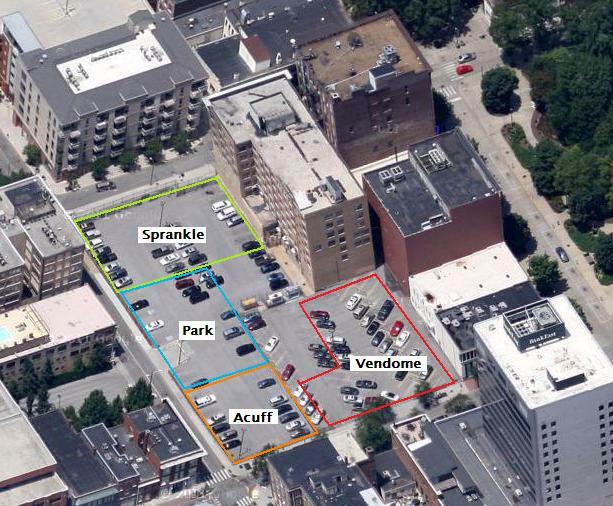 The Vendome was situated at the southern end, facing Clinch, tucked in between the Acuff building and another commercial building which housed an inordinate amount of dental offices. If you were to stand on the sidewalk today, you would have to imagine it between the Home Federal offices and the fence separating the two surface parking lots. Back to dinner at Le Parigo, if this location had been a French restaurant in 1890 (from what I can tell, it was still a residence at that time), your view would have been much different. Instead of the grey and moribund parking facility you see above, one would have been greeted by an imposing, six story structure featuring a huge gabled roof and a towering double turret. Local author and history guru, Jack Neely, did an excellent piece a few years back focusing on its opening day. Evidently, it was a grand opening gala drawing the who's who of Knoxville. That story can be viewed HERE. He does a masterful job conveying all of the pomp and circumstance involved in what must have been a glorious evening. Here, we shall try to remain focused on the building itself. The Hotel Vendome, as it was called, wasn't a hotel in the ordinary, current sense of the word. It did house people, but more in the spirit of the French usage. It refers to a full service apartment building, which is exactly what the Vendome was intended to be. Fittingly, and amazingly for the very practical residents of Knoxville, the name was pronounced VON-dome, as it is in French (it was named for the famous Parisian square). 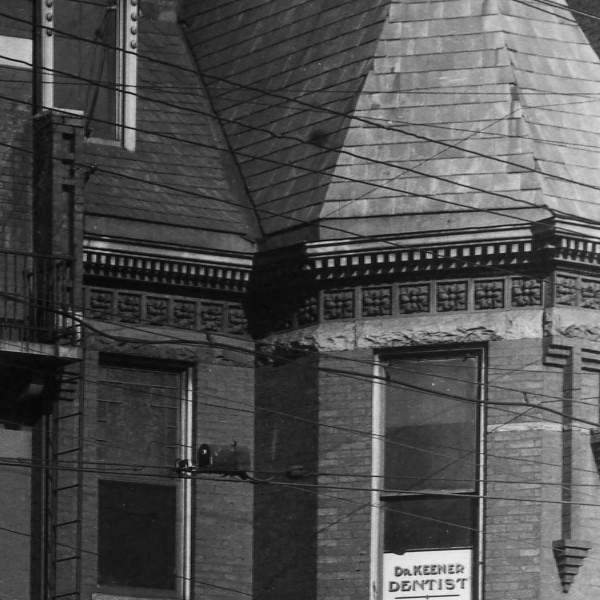 The building housed upward of 60 rooms, one restaurant, and (not surprisingly for this block) a dental office. Among the many highlights of this grand building was an elevator. According to some historians, this may have been the first elevator in Knoxville. What's more, from its construction, the Vendome was electrified. By all accounts, it was state of the art for that time. Strangely, for such a grand building, very few photographs of it exist. None of the photos in the McClung collection feature the building directly. Fortunately, there are some photos which have captured the building in the background, or as a side glance. Perhaps the best known view of the building is this artist's rendering from "Knoxville: The Progressive City of the Great and Growing South" published in 1903 in the American Journal of Commerce. I give you, the Hotel Vendome. The construction of the Vendome was begun by a couple of Knoxville investors and a fellow from Louisville, KY: Herman G. Bayless, Lewis K. Burns, and William J. Berg. The price of construction was $150,000.00 which (according to the most handy of internet calculators) would be equal to about $3.6 million today. Considering what was built, that would be an enormous bargain. 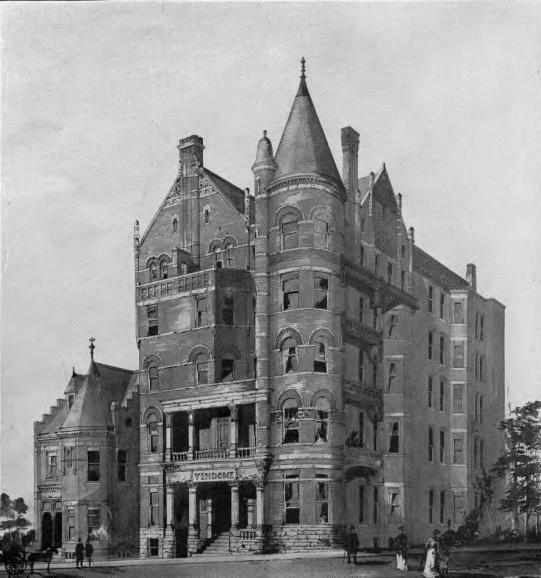 The building opened in January of 1890. A few years later, in 1893, it appears that the principal owner and manager of the Vendome was a Joseph Huckins, of Texarkana. 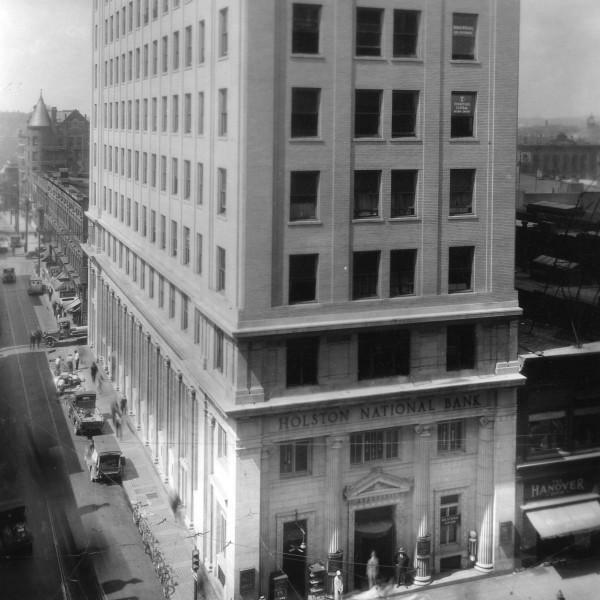 The building was designed by Beaver and Hoffmeister Architects, with Leon Beaver taking the lead. Mr. Beaver was an Ohio native who had recently moved to Knoxville. In Ohio, he was credited with designing the St. Mary's Catholic church in Massillon, OH. He also submitted a design for the Library of Congress building in 1873. That design was very nearly chosen, but ultimately was a close second runner-up. More locally, Mr. Beaver designed the Rose school in Morristown. That building is still standing and gives one an idea of how the Vendome may have looked. The Vendome, as previously mentioned, was six stories tall and constructed of dark red brick with sandstone and marble accents. The style was an eclectic melange of Romanesque, Tudor revival, and perhaps a bit of Gothic influence. 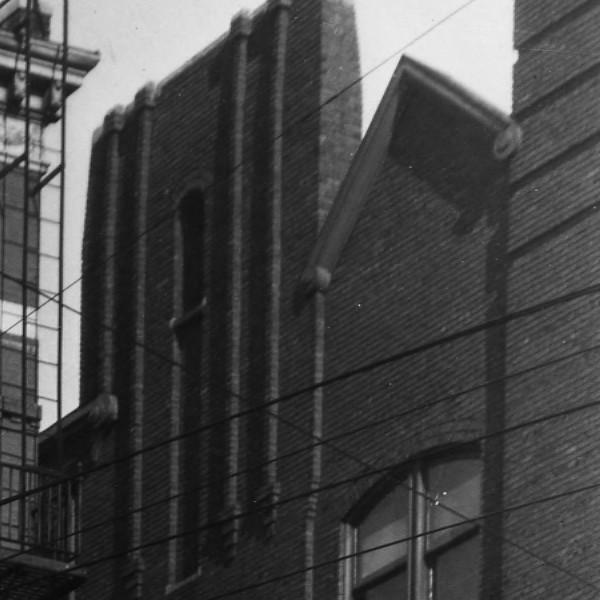 The main body of the building had a forward facing gable, which crossed a side gable toward the front. Most prominent on the facade was the large double turret and the two story columned porch. Final touches were added by the repeating arch shapes, alcoves, and massive chimneys. Additionally, the Vendome was constructed with a small annex appended to the western face. This annex looked something like a microcosmic Vendome in that it also featured a prominent two-story turret and front facing gable. Appearing as somewhat of an after thought, it was part of the original structure. Without further ado, here are the photos that I have been able to unearth, which show the Vendome . This first photo is from the office of Hugh Tyler. 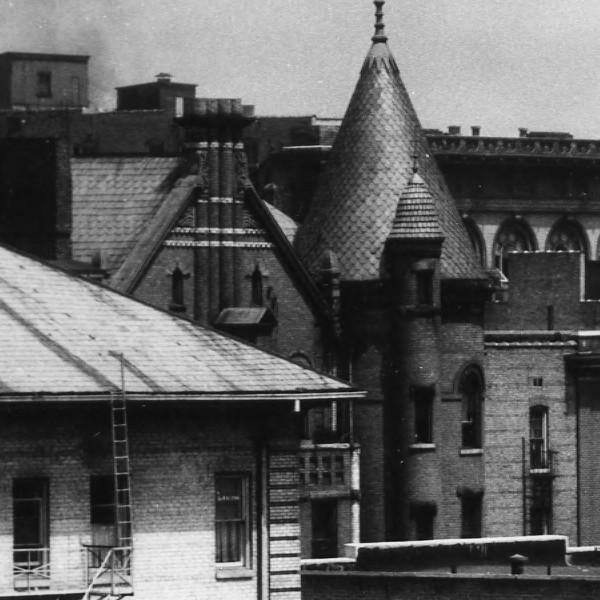 It was taken from a window in the Burwell building and looks west over Gay Street down Clinch Ave. You can see the Vendome peeking out from behind the Holston. Here is a shot taken from the block to the south and west of the Vendome. My best guess is that the photographer was standing on top of a building located about where the Hilton now stands. 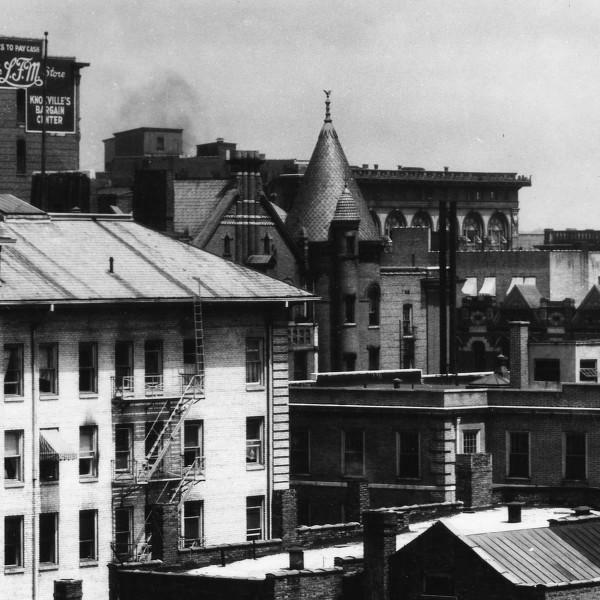 You are looking northeast with the Arnstein building on the left (featuring the LFM logo) and the Miller's building on the right. 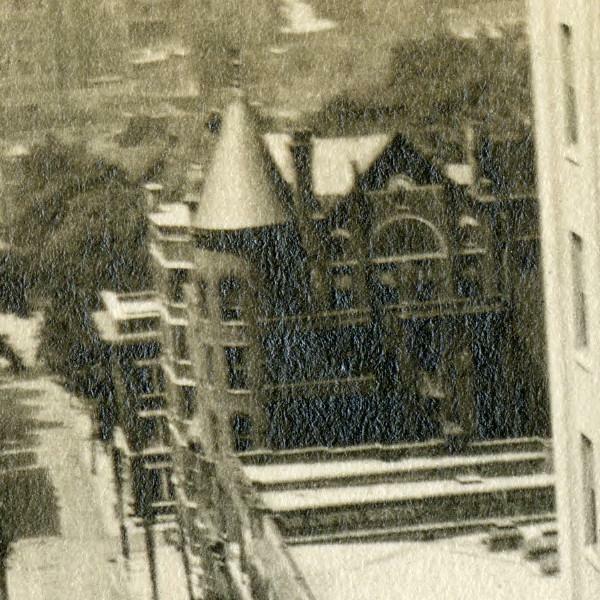 Finally, we have this small shot from the corner of Walnut Street and Clinch Ave. You are looking north up Walnut and the focus is the small annex that stood on the west side of the Vendome. Without a doubt, this was one impressive building. Most of these shots were taken in the 1920's, so the building was over 30 years old at this point. She still looked good. At this time, I have been unable to ascertain what precipitated the tearing down of the Vendome. I don't have any records of there having been a fire or anything catastrophic. My best guess is that the building had fallen into disrepair following the Great Depression the decision was made to tear down the elaborate and out of style structure to fill a practical need for parking. That's just conjecture though. Maybe I will unearth the answer one day. Until then, if you have any photos of the building, I would love to see them. I'm sure someone's great grandmother lived there or had a special occasion there that may have been captured in a family photo album. You never know. Well, on to the next parking lot to try to find some of Knoxville's lost past. Edit 12/21/2011: I found one more good picture of the Vendome, from the south looking north, head on. -All of the historical photos have been used with permission from the Knox County Library's McClung Collection. What a gorgeous building! I love this entry and I look forward to reading more from you! This is a great post. I'd love for you to show me these resources sometime. Thanks, Urban Guy. We shall have to get together on that sometime.